Beautiful master bathroom and living room remodeling in Mount Washington, Los Angeles. Of our most recent projects is this amazing master bathroom and living room renovation in the Mount Washington neighborhood in Los Angeles. The renovated bathroom features floor to ceiling Italian Porcelain with Calacatta Marble pattern, free standing tub and ceiling mount rain shower, custom wall niches for shower and a soaking tub. The infinity drain creates a flat level bathroom floor and custom glass shower partitions keep the open space concept. In order to bring natural light to the bathroom we designed and installed a custom frosted floor to ceiling window to keep with the modern design of the bathroom. To tie it up with the modern bathroom design we also installed a modern floating vanity with wall mount faucets, fabricated a custom floating mirror with LED lights behind it, and installed a wall mounted toilet. In the living room we transformed an original fireplace by creating a custom modern fireplace featuring a large venetian plaster finish and natural black stone front and hearth. We also replaced the side windows with black aluminum fixed panel windows and LED recessed lights in the ceilings. Open concept bathroom with floor to ceiling Italian porcelain tiles, infinity drain and free stand tub. Open concept bathroom with floor to ceiling Italian porcelain tiles, custom three panel window, floating vanity and wall mount toilet. Custom wall to wall mirror with LED light behind it. 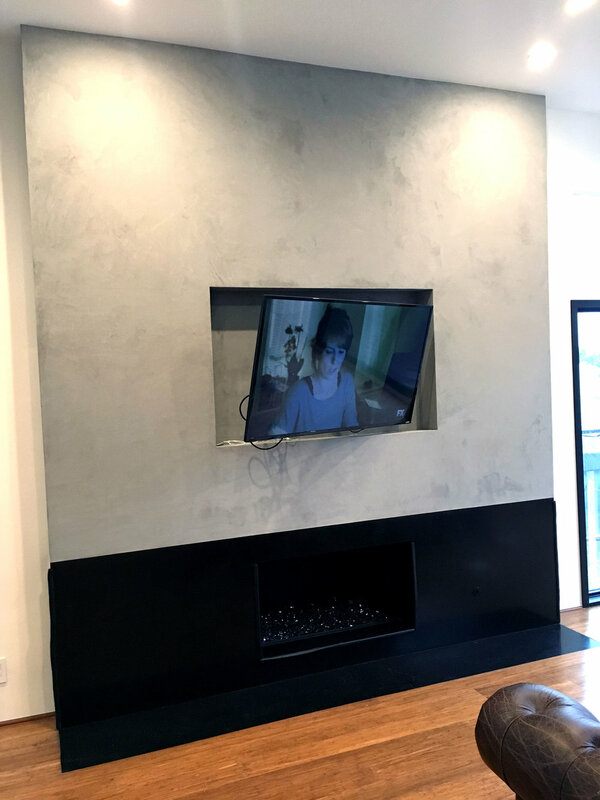 Custom Aluminum fixed panel windows, Venetian plaster finishes on the custom fireplace with recessed TV, custom fabricated natural black stone for the front and hearth fire place. 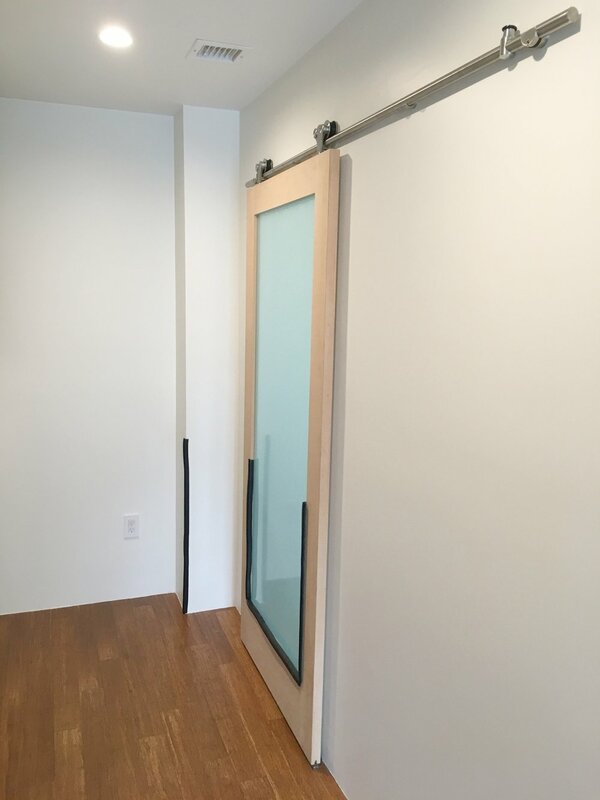 Walking closet with barn door.